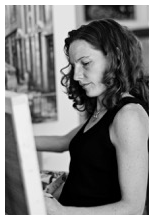 Tracy Proctor is a third generation Calgarian, artist, teacher and founder of Swirl Fine Art and Design Art Gallery. Although a self-taught artist, she has completed encaustic programs in New York, California, Santa Fe and Seattle. Her background in Interior Design has influenced her love for color and composition. Tracy teaches encaustic workshops throughout Western Canada. She is a certified R&F encaustic instructor and currently, the President of the Federation of Canadian Artists - Calgary Chapter. 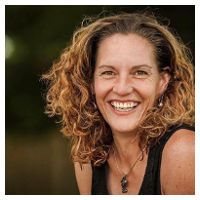 “I have a passion for encaustic (an ancient process fusing bees wax, dammar resin and oil paint with heat). I paint intuitively; layering, carving, scraping and fusing. The spontaneity of the process creates a real sense of energy. An unfolding of a mystery is revealed as each layer is built up and gouged away. Encaustic has the vibrancy of colour inherent in oil, sculptural texture and a quickness of drying that suits my impatient temperament. Yet the wax has an ethereal and luminous quality that cannot quite be achieved with any other medium. My style is a somewhat corky form of realism with vivid colour, texture and depth.""